The new service has been dubbed “Asta”, which means “Star” in Danish. While there are other satellite internet services available in Nigeria, Asta will stand apart for numerous reasons. According to Abdurrahman Mubi, Senior Technical Manager at Coollink, the service will be highly available and completely tailored to the needs and demands of Nigerian consumers; it will be affordable, will cover the whole Nigerian territory and will offer features such as speeds of up to 20 Mbps, data rollover and free night zone. “Our resources will be sculpted to strategically meet the needs of the Nigerian market to provide a better satellite broadband experience that is customized for the region”, says Mubi. Asta will be launched in August by Coollink, partner of Konnect Africa, a company set up by Eutelsat in 2015. Asta will also be available for residential customers at affordable rates in areas where broadband service was inexistent. The service will be delivered using antennas as small as 74 cm in diameter, which can be easily installed in the most difficult of terrains and in as little as two hours. “We will have nationwide and Africa-wide resellers to ensure that Asta is available to consumers all over”, says Tayo Sadare, Service Delivery Manager at Coollink.“We have one of the most reliable and diverse network capabilities so you can increase up-time, improve scalability, and materialize operational efficiency. We are not your typical ISP - we own our network, we master our solutions, and always go the extra mile,” she added. Coollink has forged its name as a major ISP in Nigeria and across Africa with a high level of customer satisfaction and the aim to create a better user experience for customers. Known as one of the most reliable ISPs in the region, Coollink is proud to make it easy for its customers to focus on the task at hand as opposed to the reliability of their Internet connection. 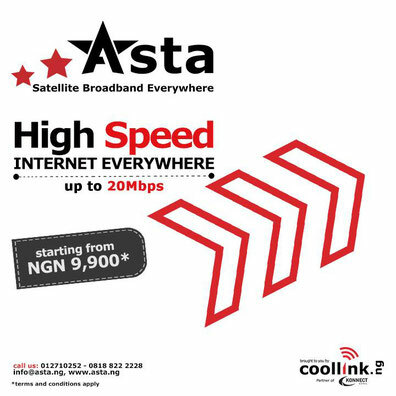 More information about Coollink can be found at https://www.coollink.ng/, and when Asta officially launches, details will be available at https://www.asta.ng. Coollink is a member of Steam Broadcasting and Communications, Ltd., part of the AIM Group Holding Company. Coollink is a Nigerian ISP and system integrator with headquarters in Lagos and a nationwide presence in Abuja, Port Harcourt, and Kano. Coollink’s goal is to be able to provide internet access to everyone and everywhere in Sub-Saharan Africa, making a positive impact on society and individuals. Set up by Eutelsat in 2015, Konnect Africa aims to be the leading player in providing state-of-the-art satellite broadband solutions to telecom operators and internet service providers throughout the African continent. Konnect Africa’s ambition is to boost social and economic development in Sub-Saharan Africa by providing affordable broadband connectivity everywhere thus reducing the digital divide. With the aim of “taking broadband further”, Konnect Africa is launching commercial service in 2017 and expects to cover most of Sub Saharan Africa by 2019.